My Minds Boggling with Design Thinking! Last spring I received a letter from Laurea University of Applied Sciences, I was accepted to study Master degree of Hospitality Management, service design. I was thrilled! I have been looking for such an education where I can exploit my past as an Artist and professional of Horeca. 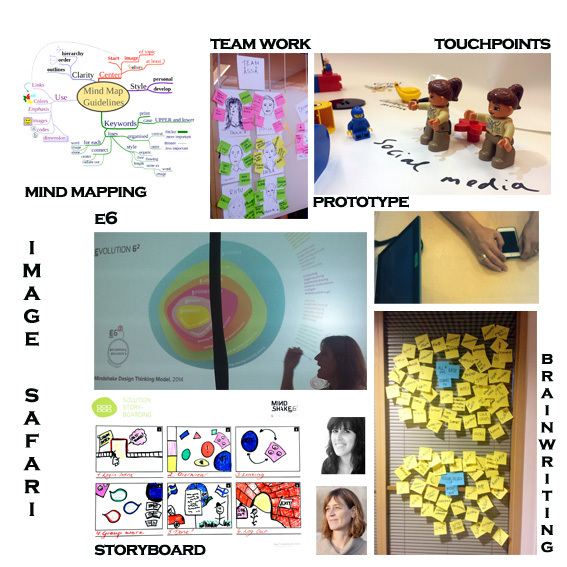 First semester started with Design thinking, lead by Katja Tschimmel and Mariana Valenca from Portugal. What a great topic to start this creative study of services. I had not heard of Design Thinking before. I was very excited and looking forward to hearing more. 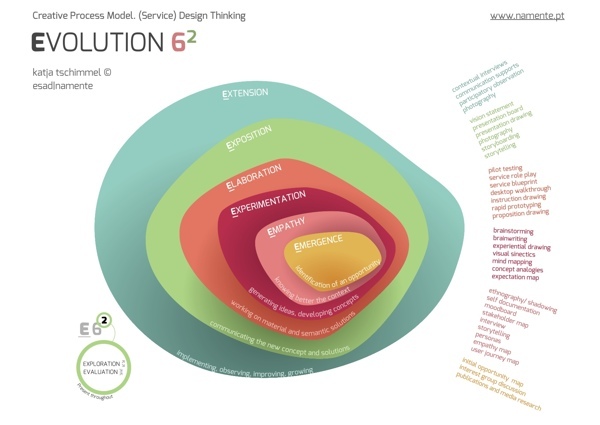 Tschimmel introduced Design Thinking to us via a model called E6. This process model has six “E”s – each process space starts with letter E.
This model can be used under several contexts such as trainings, courses and coaching. “E.6, because in Portuguese and in English, the division into 6 process spaces, which we consider the most appropriate ones, start with an ‘E’: Emergencia (Emergence), Empatia (Empathy), Experimentação (Experimentation), Elaboração (Elaboration), Exposição (Exposition) and Extensão (Extension). Since there are moments of Exploration (divergence) and Entering (convergence) in every phase of the model, we call the model E.6 elevated 2.” – Katja Tschimmel The graphic solution of this version of the model was developed by the Design Atelier Nunes e Pã. Design Thinking is observation and research. Companies may benefit from designers of their way of thinking and working. Design Thinking offers new tools to develop organizations and their services. It is a very effective toolkit for any kind of innovation process. As a great example of this innovative thinking and creative confidence gives David Kelley on his speech of “How to build your creative confidence”. He shows in his lecture example of children´s hospital´s scanner and how they re-design such a fearful experience as being scanned to an exciting adventure. Designer creates a story of a pirate ship when going to be scanned. Scanning becomes exiting adventure! This is an excellent example on how to bring creativity to life by using people involved in the service. In this particular case children wanted to come back again tomorrow – for a new trip! What is a design-friendly environment? A Design-friendly environment is a open-minded space. When we introduce design thinking to an organization, this is actually a exercise in cultural transformation. Organizations must be willing to change, challenge and rebuilt their ecosystem. “It can´t be done here” attitude does not work. Companies must have courage to believe in new ideas and their people, transforming the organizational ecosystem. Julian Jenkins (Creating the Right Environment for Design) talks in his article about the city of Sydney, Australia. I was born in Sydney and always found this city´s skyline very attractive. Not only because of the stunning Opera House, but it´s vibrant city life and international atmosphere. According to Jenkins Sydney may have its Opera House, glorious expression by Danish architect Jan Gehl, but as a whole, Sydney does not have a very healthy or life-enhancing ecosystem. Still, as a monument to the culture of progress and development at the cost of human values, Sydney is a leader. In Sydney anything is possible.Everyone´s life is welcomed. At least I have always felt so. Every Aussie has open mind! As an artist I have often hear, “ of course you can do its because you are creative”. Being creative does not mean you have to be educated as an artist or designer. It means to step out of your comfort zone. Think outside of the box and let your imagination lead you. The Design Thinking assignment in Laurea introduces a whole world of Design Thinking and the importance of team work in creative work processing. My expectations were fully filled! Tschimmel, Katja 2012. Design Thinking as an effective Toolkit for Innovation. In: Proceedings of the XXIII ISPIM Conference: Action for Innovation: Innovating from Experience. I extremely liked the David Kelley´s scanner example what you brought up. It is great example of making and redesigning something scary and weird and very emotional experience to slightly more human and less cold. Design thinking needs to take into account functionality, people´s cognitions and emotions! Finding the latent needs, that can be acute but that people, or even more children are not able to speak out loud. Hospital experience is for the most very intimidating. In addition of making and redesigning the face-to face service to be more human centred the fact that one can redesign the emotional experience with such a small idea, is brilliant! Thank you for your great comments 🙂 I also fell in love with this scanner tube example. It shows very well the idea behind design thinking and how this could be used in daily life. For my opinion creative thinking is never used too much and as you Jenni said, latent needs are the place were DT tools could be wonderfully used much more! You found a very good example of how customer-centric approach can really make a difference -the scanner of the childrens hospital is a very touching example of how big change design thinking can make. The designer has really gotten to understand the little customers, their needs and fears, and then developed something based on that understanding that has made a scary experience a little more user friendly. I’m going to use this example too in the future when describing to someone what is design thinking -love this!